“Learning to look at art is a particularly effective way to help elementary students develop critical thinking skills,” according to a report on a three-year study by Boston’s Isabella Stewart Gardner Museum that was released Thursday. Gardner educators directed the study with help from researchers from the Maryland-based nonprofit Institute for Learning Innovation and consultants from the New York nonprofit Visual Understanding in Education. The work was supported by a $750,000 grant from the U.S. Department of Education in 2003. The Gardner study compared the skills of students from students in grades three to five from two local schools who made multiple guided visits to the museum over three years to look and talk about art as part of its School Partnership Program to students who did not. “Treatment students had more to say about works of art than did control students, making more observations and noticing more details about art objects. On average, treatment students talked about twice as much as control group students, a significant difference. Students’ use of evidence to support their statements about artworks also differed significantly between treatment and control groups, with treatment students significantly more likely to offer justification for their ideas. provide a collective, compelling and corroborated argument for the substantial quantitative value of museum education programs for elementary students – and the Gardner’s place in this larger story. The Guggenheim study showed a correlation between artists’ classroom visits and improved literacy in students involved in their “Learning Through Art” program. The Wolfsonian’s findings, released in March 2006, saw significant improvements in reading and mathematics as a result of its intense 10-week “Artful Citizenship” program. “Shoot the Family,” a traveling show of avant-garde family photos organized by Independent Curators International, closes tomorrow at MassArt. 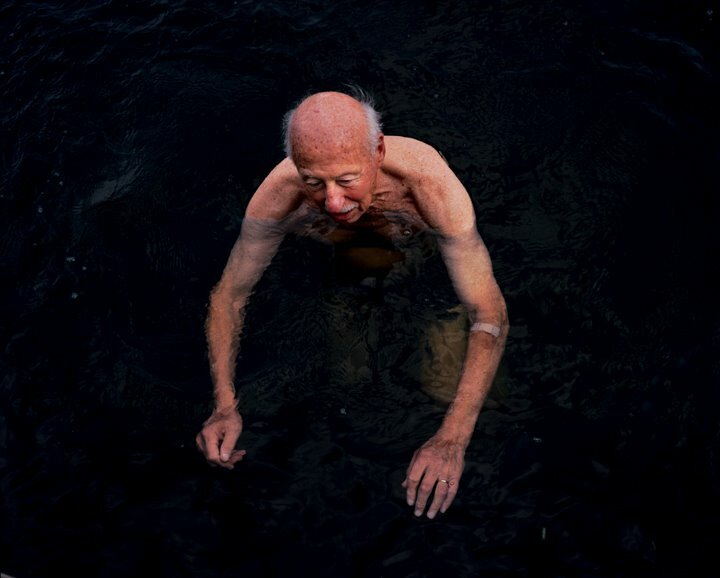 Among the 16 photographers is New Yorker Mitch Epstein who returned to his hometown of Holyoke, Massachusetts, to document the demise of his father’s furniture store in 1999. Epstein’s “Family Business” project is represented here by a pair of photos – his old man swimming, a briefcase on a bare mattress – and a video mixing images of his parents’ 50th wedding anniversary with footage of his father marking prices on items for a final sale at his shop. The large color 2002 photo “Dad, Hampton Ponds III” (above) shows his father, after suffering a stroke, swimming in a pond. It’s shot from above, showing his bald head, his scrawny arms stretched forward. It’s a good photo, not great. But the water – clear and cool and bottomlessly black – is lovely. And Epstein notices the detail of the Band-Aid on his father’s left forearm, which somehow symbolizes all the old man’s frailty for me. “Shoot the Family,” MassArt, 621 Huntington Ave., Boston, Jan. 15 to March 10, 2007. How to tell a joke? 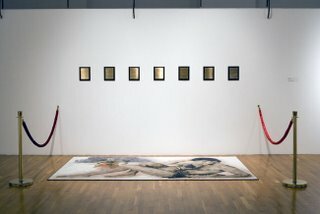 First, on the floor is a plush carpet decorated with an image of the television star David Hasselhoff, naked, reclining with a pair of shar pei puppies (above the photo McLeod used, below installation shot). Above his legs the carpet bears another image of Hasselhoff, this time dashing through surf Baywatch-style. Hasselhoff’s fame is predicated on appearing in camp television classics, Knight Rider and Baywatch; his hunky body; and the acting chops of a Ken doll. Oh, and getting misty eyed when Taylor Hicks won “American Idol.” By some amazing American pop culture magic, his, uh, allure multiplies beyond these root causes. I think it has something to do with him being good, giving, and game enough to play along with his plastic persona (see “The Spongebob Squarepants Movie”). But whatever it is, McLeod’s straight-faced shrine to the Hoff taps it brilliantly. I suppose McLeod is saying something about the nincompoops we, as a society, venerate. And there’s an implied critique of Hollywood stars' inflated sense of themselves. (Though, I think if you read Hasselhoff’s statements in context – and the Internets suggest the ones McLeod quotes may be real – you realize he’s in on the joke.) But these issues are tangents. This is just a great, hilarious, satisfying goof. Stay tuned: McLeod is rumored to have a Suzanne Somers ThighMaster piece too. Also noteworthy in "Selections '07" are three sculptures by Matthew Hincman. Here’s his curled in on itself park bench that he snuck into Jamaica Pond last year. There’s also altered wooden blinds and “Bed/Table” (2001) (pictured above), a finely crafted wooden table with a mini bed headboard sprouting from one end. He specializes in such charming furniture mutations. 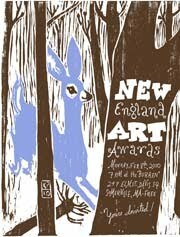 “Selections ’07,” MassArt, 621 Huntington Ave., Boston, Jan. 30 to March 10, 2007. Here’s my review of “Drawing on Hopper” at the Williams College Museum of Art, a show that demonstrates the influence of painter Edward Hopper on photographer Gregory Crewdson. 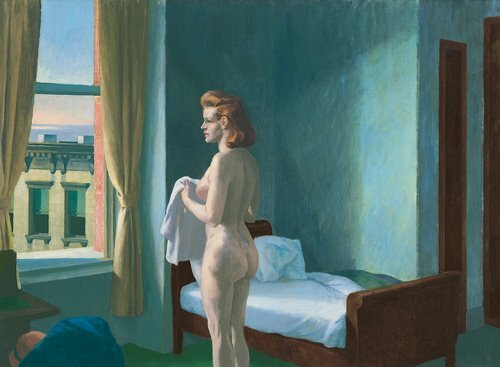 (Above Crewdson’s 2004 photo “Untitled (Woman at the Vanity)”; at left, Hopper’s 1944 painting “Morning in a City.) Interestingly, they’re both New York artists who’ve done major work in Massachusetts – Hopper at Gloucester and Cape Cod, Crewdson in North Adams, Pittsfield, and Lee. Crewdson admits to many influences, but one he doesn’t usually mention is the late Henry Darger, who is coming to seem a preeminent inspiration for art today. But the outsider artist’s legacy can be seen directly in homages like Paul Chan’s “Happiness (Finally) After 35,000 Years of Civilization – after Henry Darger and Charles Fourier” (2003) (above) in MassMoCA’s “Ahistoric Occasion” through April 22. Chan’s piece is basically a fidgety, pixely digital animation knock-off of Darger. And Darger’s influence is easily detected in all the high-school-notebook-doodle-style art around these days. See Providence’s C.F. 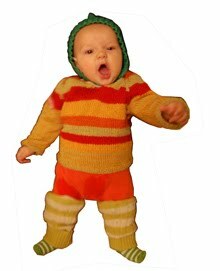 But it’s not just Darger’s look. He’s also a touchstone for the return of narrative art – especially the growing body of invented (and often inscrutable) personal mythology art. Think Matthew Barney’s epic film allegories about testicles. 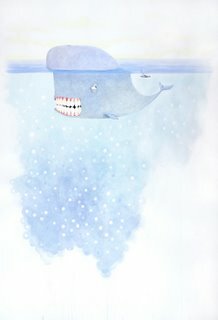 Or, closer to home, check out Bostonian Ria Brodell’s drawings and paintings of “The Distant Lands” (see one at left), shown at Rhys Gallery last November, in which a toothy whale and a teeny submarine are pals united in some enigmatic conflict involving bird men and mud monsters and worm-bunnies. Part of the fun is trying to puzzle the story out. It’s here, as an eccentric-narrative artist, that Crewdson fits into the School of Darger. The rise of the School of Darger indicates a longing for passion, for myth, for hand-made, for color, for hot flashes, for messiness. For all the wonderfully human stuff that has mostly been driven out of the avant-garde art since abstract expressionism. 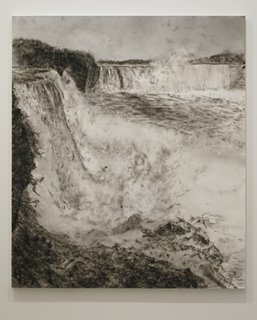 “Drawing on Hopper: Gregory Crewdson/Edward Hopper,” Williams College Museum of Art, Williamstown, Massachusetts, Oct. 12, 2006, to April 15, 2007. Global warming is the theme in art this year – thanks in great part to Al Gore’s 2006 film “Inconvenient Truth,” Jared Diamond’s 2005 book “Collapse,” and Elizabeth Kolbert’s stunning reports in The New Yorker, which were collected in her 2006 book “Field Notes from a Catastrophe” (our generation’s “Silent Spring”?). She attributes it to the dense, obscure and purposely dispassionate language of science – a language that reflects its careful devotion to unbiased data. This is where art can be helpful. Kolbert’s writing and, especially, Gore’s film demonstrate the power of art to convey the drama and urgency of a great environmental, social and political problem to a broad public, and move the debate forward. 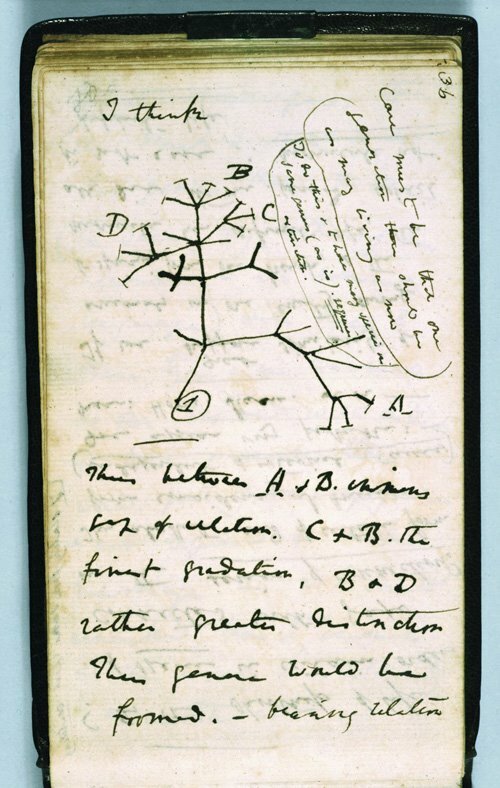 Of the many Darwin relics here, among the most striking is a tiny notebook from the late 1830s in which he scribbled “I think” and then a diagram of what looks like a bare twig. It’s an early stab at an evolutionary tree. 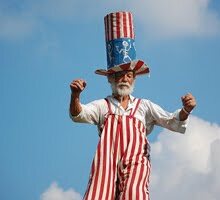 He’s homing in on the big new idea, and the air is electric. 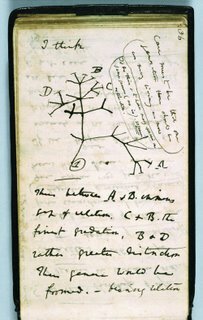 “Darwin,” Museum of Science, Science Park, Boston, Feb. 18 to April 27, 2007. 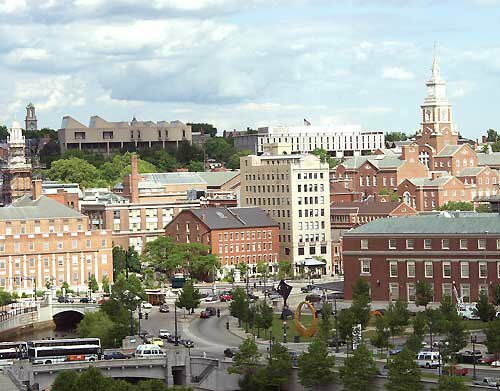 How did Providence earn the “alternative vacation destination” distinction? "The capital of one of the nation’s 13 original colonies and the home of several prestigious colleges, Providence, R.I., has a colorful four-century history proudly and prominently displayed in landmark structures, a Victorian-era park and a blazing riverfront festival that has revitalized this historic city." That’s, of course, Barnaby Evans’, uh, historically preserved WaterFire they’re giving credit for revitalizing Providence. Congratulations. I think. Chatham, Massachusetts, also makes the list. As far as I can tell Chatham’s honor seems to have nothing to do with setting stuff on fire. My goofy title doesn’t cover all the generally cool, Internationalist style work included, but the primary M.O. of the four artist-finalists is data processing – sorting through all our inundating digital, virtual, mass-produced shiny 21st century stuff for glimpses of insight and humanity. Ultimately, it seems to be about seeking some sort of human connection. The tactic is most apparent in the work of Kelly Sherman of Cambridge, the finalist who last month won the biennial Foster Prize (formerly known as the ICA Prize), which honors “a Boston-area artist of exceptional promise” with $25,000. Sherman’s “Wish Lists” (2006) (shown above) features tacked-up print-outs of wish lists she found on the Internet. Aaron wishes for a dog, pogo stick and cd player. Jennifer wants “Strawberry Shortcake dolls, Strawberry Shortcake sleeping bag, Strawberry Shortcake cuddle pillow, anything Strawberry Shortcake.” Susan wants “ a grave to put my father to rest (for my father).” Virginia hopes to “remodel my house” and “find my father.” Taken together the lists contrast our desires for stuff versus our desires for human connection. But it feels too unprocessed, too much like a grad school conceptual exercise. Not to mention that computer print-outs tacked up on walls are among the most irritating art-viewing experiences. It turns the engagement with the art into homework. They might be more effective as a book (or in Found magazine), something intimate, something you could linger over. “Seating Plan” (2006) maps the complicated wedding hall seating arrangements required by divorces and remarriages. 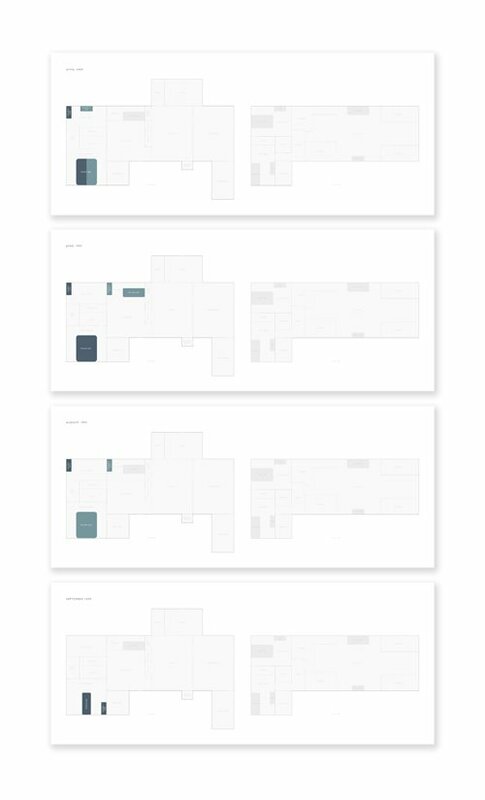 “The Family House” (2002-2006) (at left) diagrams the changing layouts of her family’s home during the stages of her parents' divorce. Sherman aims to turn these messy, highly charged emotional events into clear, rational, understandable charts and graphs. There's something to this idea. 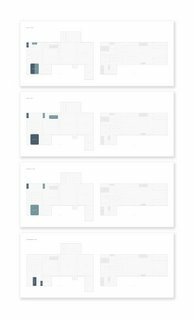 It notes how our documents and diagrams hold our emotional histories. But her presentation has all the charm of an accountant’s spreadsheet. I wish what pleasures there are to be had here weren’t so strictly cerebral (which applies to the Foster Prize exhibit generally). But there’s something telling in her translation of emotions into cold diagrams – in her seeking ways to keep feelings at a safe distance. Needham artist Rachel Perry Welty produces a more crafty and dryly humorous version of database art in which she turns accumulations of quotidian detritus into minimalist sculptures. 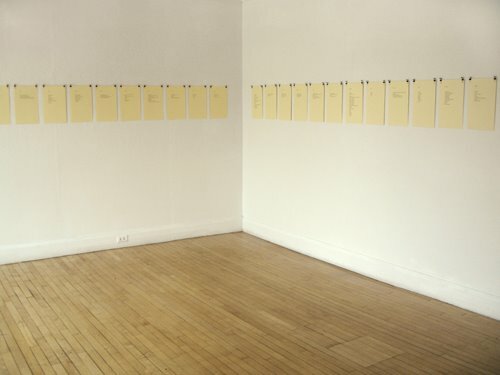 “Food Pyramid” (2006) (at left, in blurry background) is a group of tiny reproductions of containers of food her family has consumed, stuck to the wall in triangular arrangements, to document their dining. In the 1960s, Jasper Johns wrote a recipe for art: “Take an object. Do something to it. Do something else to it.” Welty’s “Food Pyramid” feels thin (like Sherman's "Wish Lists") because she accomplishes the first two steps but doesn't quite get to the third transforming phase: do something else to it. 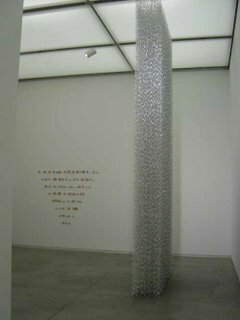 During Welty’s “Traveling Scholars” exhibit at Boston’s Museum of Fine Arts in 2006, I was amused by her “Column B” (2006), which featured shimmering chains of silver twist ties cascading down from the ceiling. Their arrangement echoed the shape of the gallery’s white support column, pointing out the solidity of the real column and the sensitivity of her twist tie column to even the slightest breeze. And it was a wry joke besides. 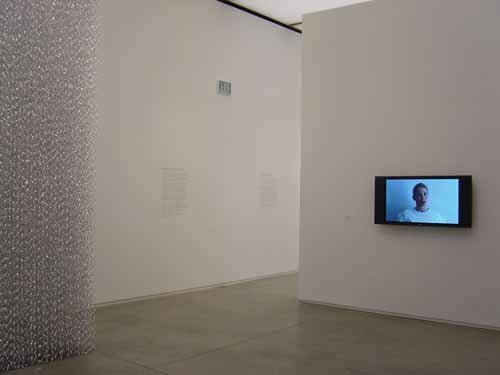 Here “Wall” (2006) (shown in the two photos above) again features chains of silver twist ties dangling from the ceiling, but this time it echoes the shape of the gallery’s temporary wall. Welty’s minimalist sculptures are highly sensitive to how they’re displayed and “Wall” is diminished by being stuck in a corner. This mutes both its reference to the actual wall and its evanescence. I wasn’t much taken by her video “Karaoke Wrong Number” (2004) (above and at left) when I saw it in the “Traveling Scholars” show, but here it works for me. It’s straightforward: Welty in a white shirt, seated in a white room, channels the voices and expressions of callers who mistakenly left messages on her answering machine – someone wishing someone a happy New Year, a guy from the Boston election department, a call about taxes. It’s a sly, funny performance. And this time around, it strikes me as a piece about the lonely, disconnected feelings we have amidst all the electronic communications that are supposed to bring us closer together. Bostonian Jane Marsching’s “Arctic Listening Post” installation is a series of riffs on the Arctic and global warming. Global climate change is the hot art subject of the moment, but Marsching’s work here does little more than note the issue. 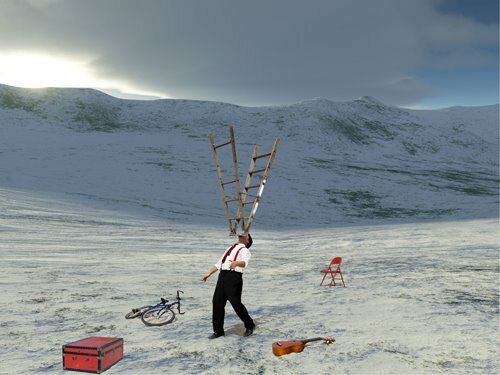 Inspired by accounts of 19th century explorers who passed the time by staging full-costume dramas in the Arctic, Marsching creates fake photos (one example is shown above) of clowning arctic adventurers – twisting balloons into canoes, balancing ladders on their chins, riding bicycles. It’s a lame one-liner. 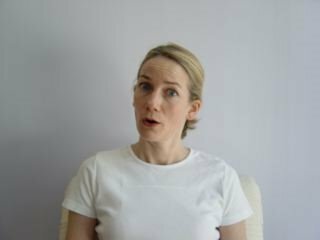 And her video appropriated from a government webcam of the North Pole dubbed with tinkling arctic sounds sampled from the Internet is less than the sum of its parts. Her Climate Commons blog had potential though. 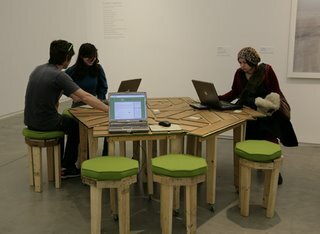 Marsching and assistants built a table and stools from scraps recycled from the construction of the new ICA building. There (as show above) you can sit at laptops to read a group blog about “climate change, sustainability, and the Arctic” authored by Marsching and her gang: an Episcopal priest, a journalist, a scientist, a comedian, activists. 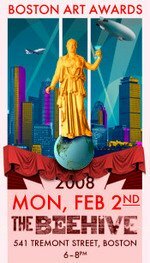 Climate Commons is part of the trade show style that a growing number of artists have adopted – they organize trade-show-like gatherings of new scientific discoveries or inventions rather than exhibiting their own original works. It’s another twist on database art. A prominent example was designer Bruce Mau’s “Massive Change: The Future of Global Design,” a large science-museum-type exhibition of “the latest innovations in the fields of urban design, transportation, information design” at Chicago’s Museum of Contemporary Art last fall. I’d hoped Climate Commons would be an artist-scientist think tank, combining scientific musing and eco activism with art’s wild brainstorming. It is successful as a clearinghouse for eco news, inspirational quotes and pretty photos, but offers little original news, ideas or analysis (a weakness of many blogs). And the dozen or so contributors don’t much cross-pollinate – the point of this sort of collaboration (and the Web too). A missed opportunity. Sheila Gallagher of Jamaica Plain found inspiration for her “Unknown Source” installation in some esoteric 14th century Christian mystical text. Her concern is the sublime – as in 19th century Hudson River School landscape painting (rather than data processing). She presents paintings in soot and smoke of Niagara Falls (above) and a wooded mountain. It’s a neat formal gimmick, I guess, but the paintings don’t feel like more than imitations. 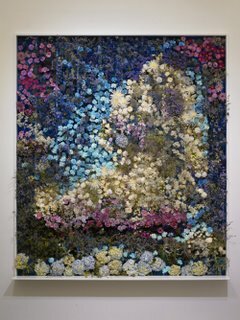 But she succeeds with “Cumulonimbus” (2006) (at left, and detail at very top of this post), the best work in the Foster Prize show. 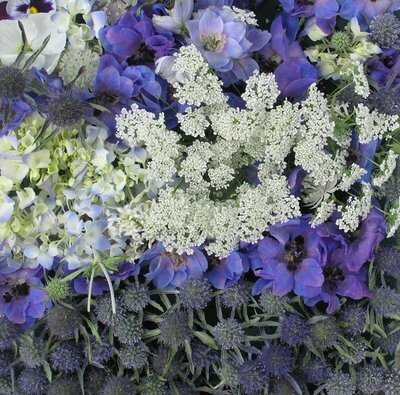 She stuck dozens and dozens of fresh, fragrant pink, blue and white roses, delphinium, carnations and rhododendrons into an a recessed wall of irrigated blue foam. The blossoms are arranged into the vague shape of a thunder cloud (hence the title). It has the blast of beauty you’d expect from so many flowers so densely packed together. What fascinates me is how it evokes a grand, posh version of the feeling that comes from wedding corsages or trickling desktop Zen fountains. It reveals a particularly middle class (tacky?) version of the sublime. 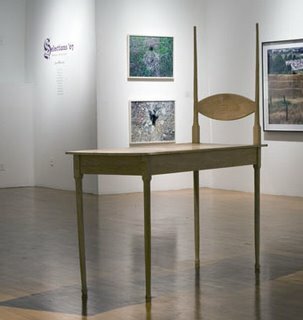 “Foster Prize” exhibit, Institute of Contemporary Art, 100 Northern Ave., Boston, Dec. 10, 2006, to March 11, 2007.